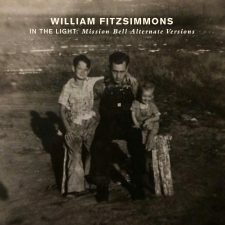 Big announcement – the new William Fitzsimmons EP In The Light: Mission Bell Alternate Versions is available to stream and download NOW! Check it out here. I believe there are two sides to every story. And the story behind the Mission Bell record is no exception. The alternative versions represent a completely different way of seeing the story of two people realizing that there time together has come to an end. Above anything else I hope these songs remind you that you’re not alone in whatever pain you’re going through.